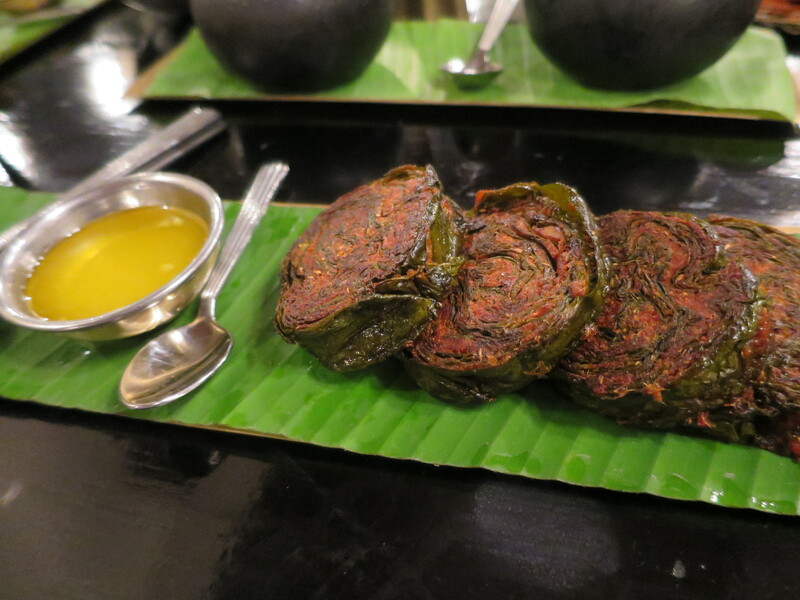 I have heard and read about the Karavalli restaurant in Bangalore many times and have put it on my list of restaurants to visit when in India. And so there I was not once but twice in a week. 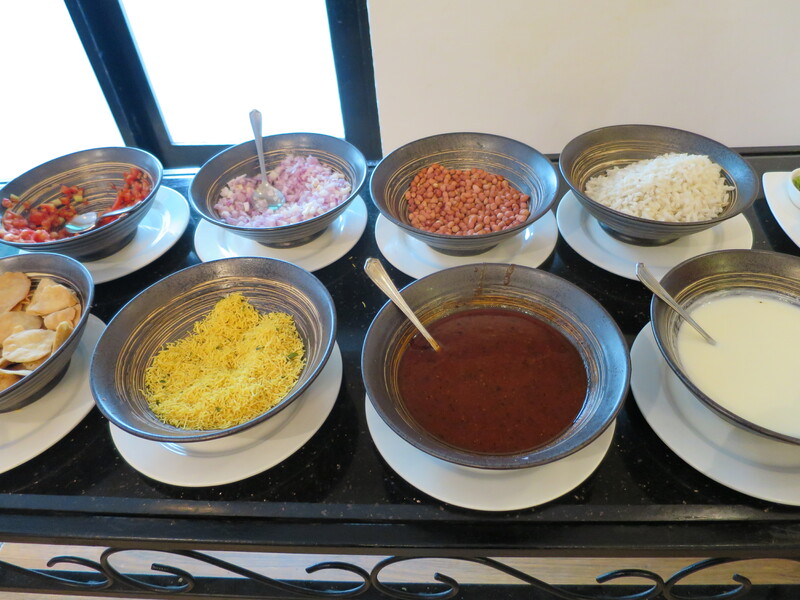 Located at the Gateway Hotel, the Karavalli is known for its well-researched home-style Indian recipes from the best of the Konkani, Kodava, Mangalorean, Calicut Muslim, Syrian Christians, Brahmins and the Goanese homes. 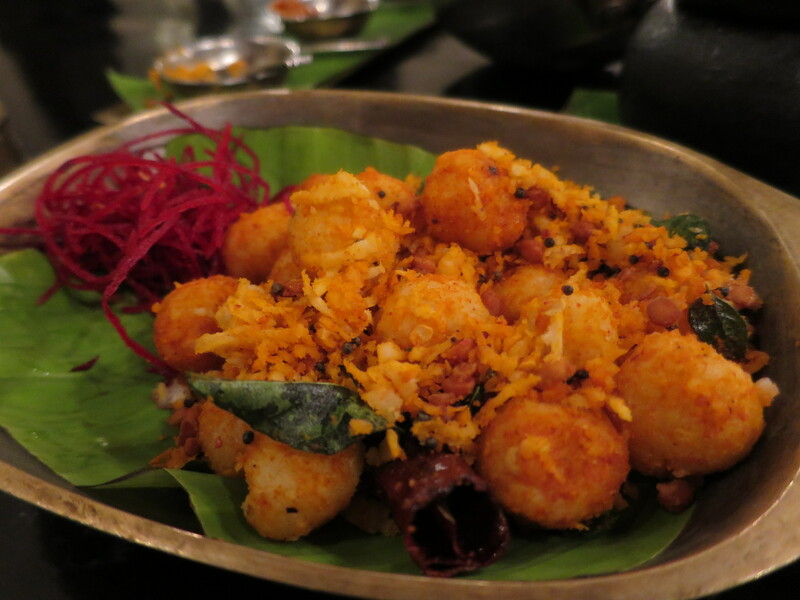 Karavalli means “land by the shore” in Kannada which explains why the cuisine consists mostly of coastal dishes. The chefs have spent over 22 years doing research on the recipes. 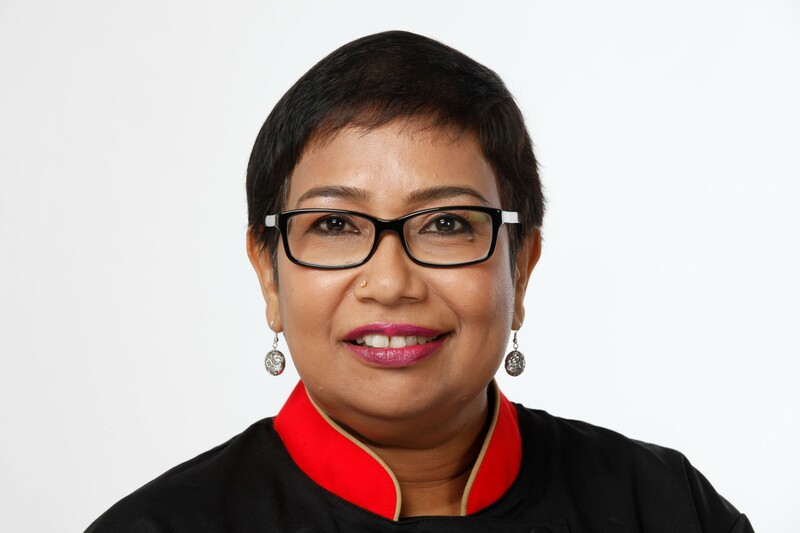 The restaurant has won several National and international awards and has been listed as one of the best restaurants in the world in the Miele Food Guide. This quaint colonial bungalow-styled restaurant’s interior was inspired by the traditional architecture of a Mangalorean home. A pebble stoned pathway leads to the restaurant from the Gateway Hotel. As I entered the restaurant, I felt like as if I was entering an Indian home. Executive Chef Naren Thimmaiah, who has been with the Taj group of hotels for more than 24 years, has a very tight schedule daily His day starts as early as 7 am and sometimes never ends at midnight. The Karavalli restaurant is always booked for one occasion or another and has been visited by famous personalities from all over the world. Chef Naren is often very busy, looking after the catering service which is a big part of the hotel’s business. Food is sometimes catered to as many as 13,000 people at any one time, involving about 300 service people for the occasion. Organizing 75 tandoor ovens to setting up 65 buffet stations – all come under his purview. 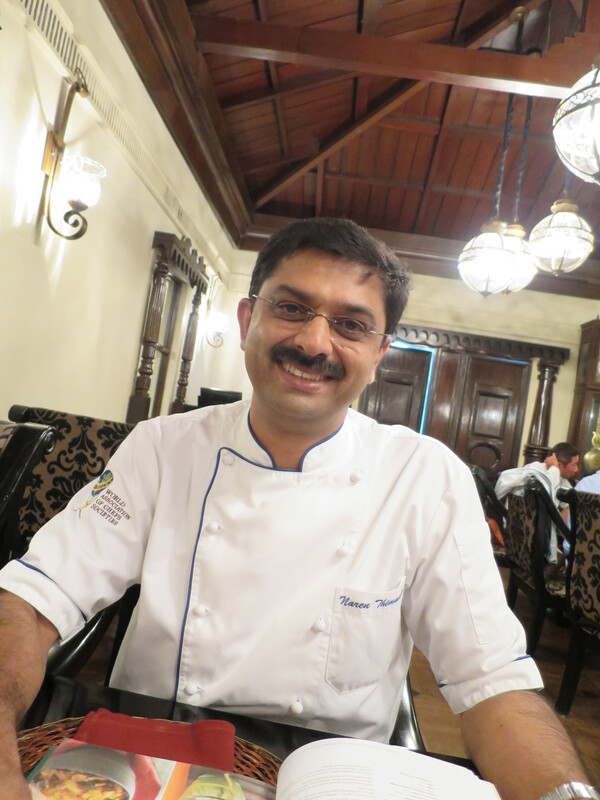 The ever smiling Chef Naren’s food philosophy is to “create and serve honest food”. He explained to me that the recipes feature unique ingredients like toddy vinegar from Goa, home-made clarified butter, Kundapur coconut and Kodampuli (a souring agent used for seafood). Some of these exotic ingredients are sourced around from villages. I was given a small mug of spicy, hot and tangy rasam , a watery lentil soup , tempered with spices ,to titillate my palate. Indians either have it with rice or drink it on its own.. Chef Naren, arranged for me to taste some of the popular dishes after inquiring about my preferences. The menu had an extensive list of dishes, but I wanted to try those that I had never tried elsewhere or popular at the Karavalli. Here are some of the dishes I tried. The Oggaraneda Aritha Pundi , small, steamed rice dumplings tempered with mustard seeds, cumin seeds, grated coconut and chilli powder, was one of my favourites. Though they require a simple preparation, the flavour is unbelievably fabulous and are suitable for vegetarians. The prawn dish Camaro Con Cilantro had the right balance of flavour and colour. The prawns were sautéed in a saffron sauce with lots of chopped coriander leaves. Karavalli’s special, the Kundapura Chicken Ghee Roast was next. 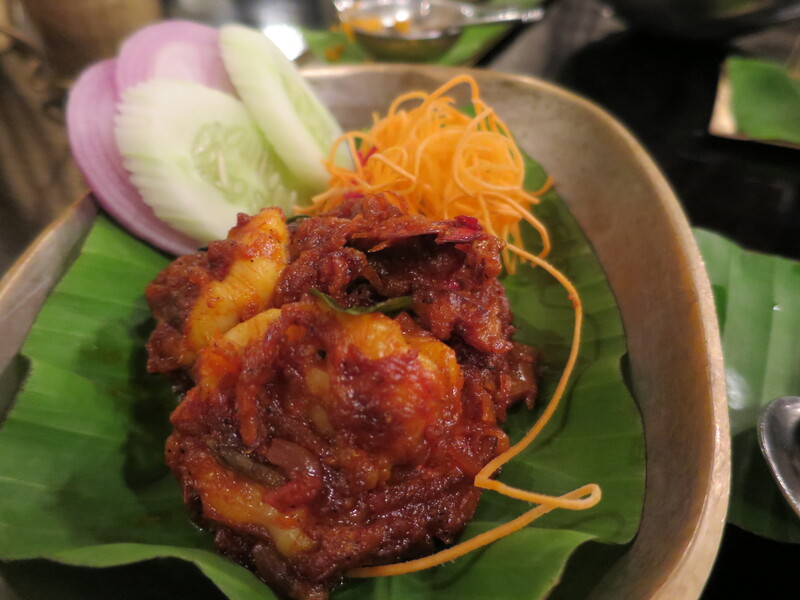 The tender, mildly spiced chicken pieces had the famous Kundapura coconut in it. The unique Patrade dish was painstakingly prepared. Coarsely ground lentils and spices were cooked into a paste and applied thickly on yam leaves which were then rolled and steamed for a while and left to cool and then sliced and pan fried till light crisp and then served. The Pothi Chor is really an unusual dish! 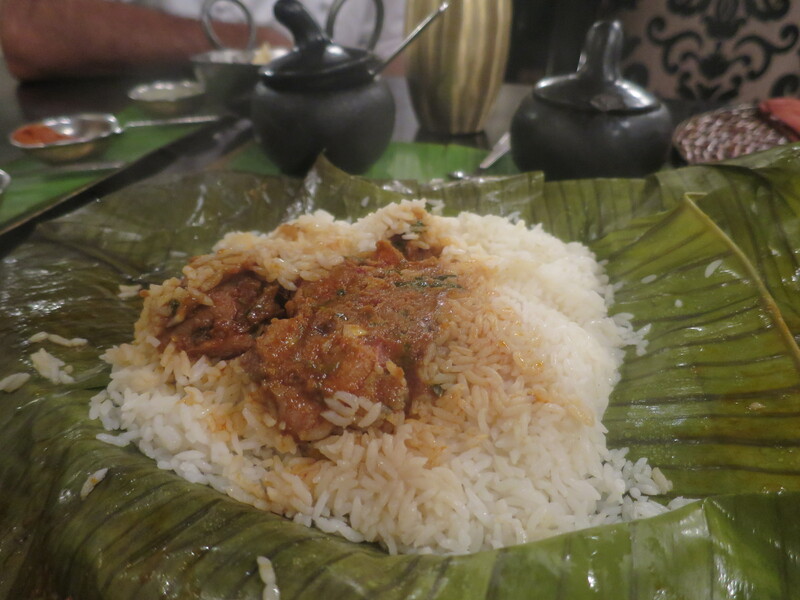 It is a kind of ghee rice and chicken curry combo wrapped in banana leaf and steamed. I liked this dish so much that I ordered it on the second day of my stay. Other dishes I tried were the bitter gourd and sugar cane dish with appam and the very tasty Koli Barthad , pan-fried chicken pieces in a blend of roasted spices and Coorg vinegar. The latter is also known as kachampuli , a dark, tart vinegar, which is indispensable in Coorg kitchens and is used as a souring and thickening agent. 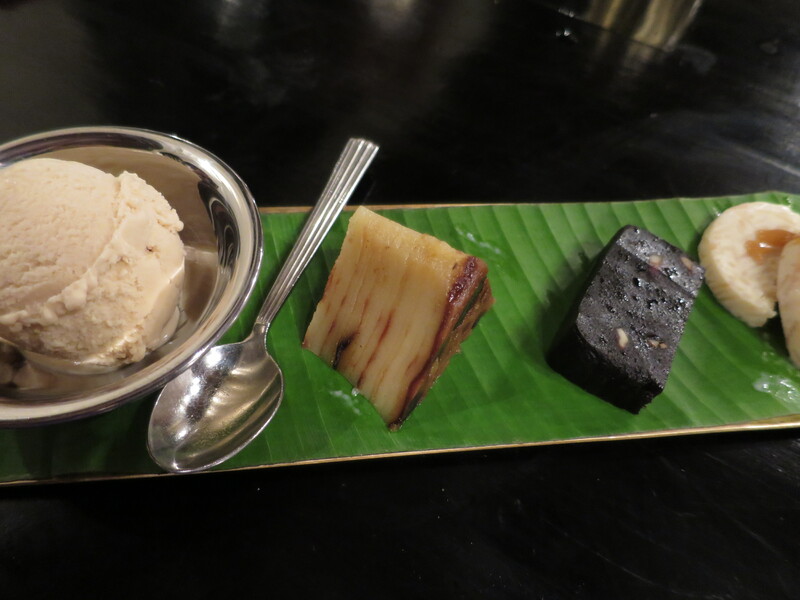 The most outstanding dessert was a piece of the Goanese dodol. It is a sticky dark, almost black dessert made of Goanese palm sugar, thick coconut milk and Goanese red rice flour. It is sweet, sticky and luscious and heavy with coconut milk. I liked it so much that when I highlighted it to Chef Naren, he actually packed for me 1 kg of the dodol to take home!! I also tried the lip smacking tamarind ice cream. The Bebinca, a multi layered Goanese cake, is to die for – literally with all that coconut milk and eggs. There are many options for vegetarians in this restaurant. Chef Naren Thimmiah also arranged a cooking class especially for me where I was taught the nitty gritties of making some of the traditional Kannada dishes. 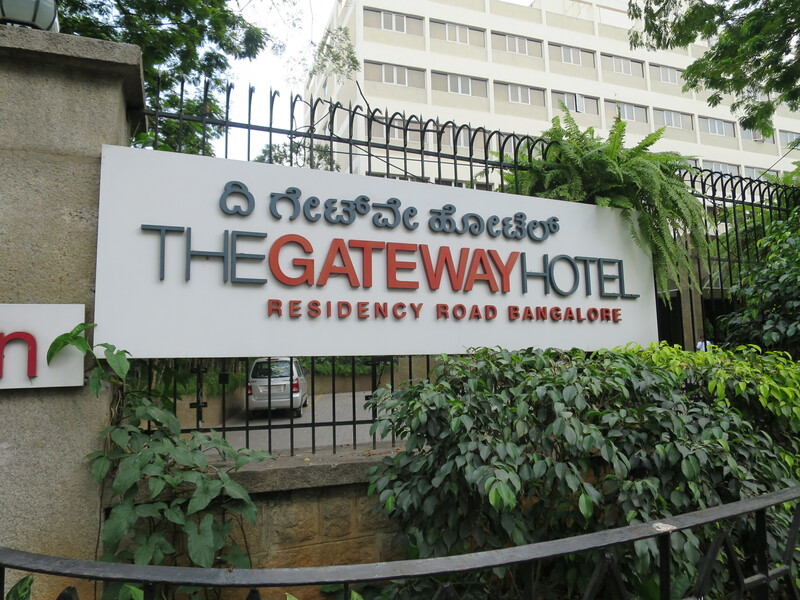 The Taj group of hotels had impressed me with the very detailed hospitality during my sponsored stay at the Gateway.